As an exercise fanatic I was thrilled to find out about the Spartan obstacle race that comes to Barcelona every year. Loving a new challenge, I made Spartan my excuse to get “out of my fitness comfort zone” in 2019. As a trainer it is important to shake it up as every discipline has its benefits and something to take away. On sign up I assessed my fitness routine. Like most people I am better at certain types of physical activities than others and I stay with what I know, what I tend to be good at. The type of fitness needed for an obstacle duration course is not my forte so I got to thinking about my training routine and how I could add or change it to get myself all round fit. My fitness route normally consisted of…Monday yoga, Tuesday trapeze, Wednesdays Pilates, Thursday rest. Friday Pilates, Saturday weights, Sunday rest. I realise that to get myself up to speed I would have to ramp up and change my routine adding at least 2 HIT training and a cardio training to my week…BUT WHEN was my first reaction! And cardio, yuck, was my second. 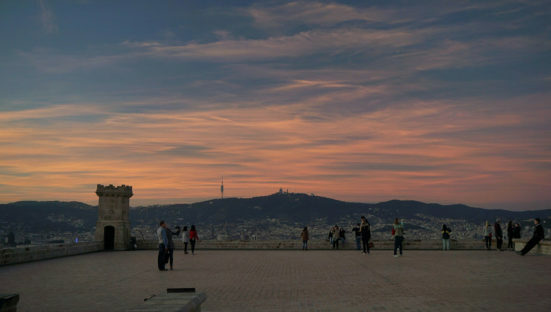 I changed my Thursday rest to a run which I’ve always loathed so I set myself some encouragement, a purpose, to run to Montjuïc castle, a difficult but rewarding 6K there and back. A beautiful run through the botanic parks, past view points and finally arriving at the historic castle. A few seconds to admire the view, catch my breath and then downhill where my legs seemed to work on their own. At the end of the run it’s a few stretches and some Pilates abdominal and back exercises to keep that lower back from aching after such a steep incline. 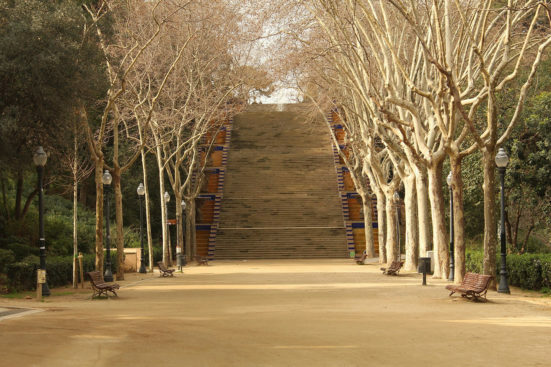 I live near Montjuïc, and really appreciate the luxury of being in such a great city and so close to nature. Barcelona has a lot of fantastic outside spaces to train in. HITT training, I have been hearing about cross fit for years and how it’s a great combination of cardio and strength training. I usually go to the cross fit in the Raval as it’s near my house. It’s important for me that my training centre is near my house or work as it helps me to keep motivated in those lazy days. So off I trot for a tough and sweaty 55 minutes. High on endorphins and exhausted I am happy to again train out of my comfort zone and know that true fitness is a combination of activities and skills. 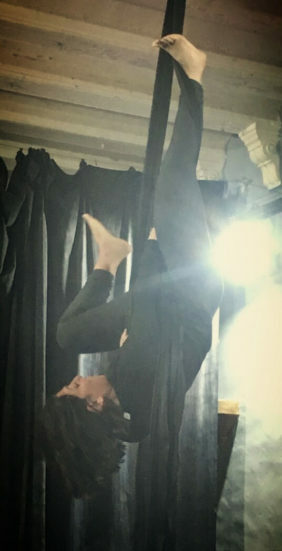 Finally, I assess my holistic training; trapeze, yoga and Pilates. Trapeze being a great all body functional workout, using your own body weight to train. Functional training is very popular nowadays and give you a great work without all the tools and stuff. Barcelona offers a lot of aerial classes which combine art with exercise. I attend trapeze classes in El Born, in an association called Rai. 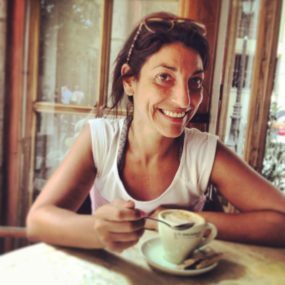 The teacher Bea is strict but knowledgeable and the classes are fun and dynamic. Yoga is essentially meditation; however, some more physical yoga styles will also get you strong and flexible, keeping your muscles long, flexible and healthy. Sometimes I opt for a yoga class to feed the fire and stretch to the max, other times a gentle yoga class to calm my mind and send some love to my body. I tend to go to rocket yoga for my high energy workouts and hatha yoga for the more relaxing workouts. As a Yoga teacher I urge people to find your style, find your teacher, and take the time to connect with your body. As an osteopath and Pilate’s instructor I know that Pilates is and always will be the corner-stone to my exercise routine. As someone who has suffered for years from a back injury, I know that I would not be able to train as I do without Pilates. Pilates is not only an exercise method for injury prevention as well as rehabilitation, but also contributes to my training routine in terms of improving my core strength, flexibility and body awareness. And finally my rest days when I love to be in the sun, eating socialising and spending time at home pottering. I am lucky enough to live in Poble Sec where there are a range of great pincho places and restaurants. I love to experiment and tend to restaurant hop and bar hop rather than have favourite’s, all are great in terms of food and having outside space. 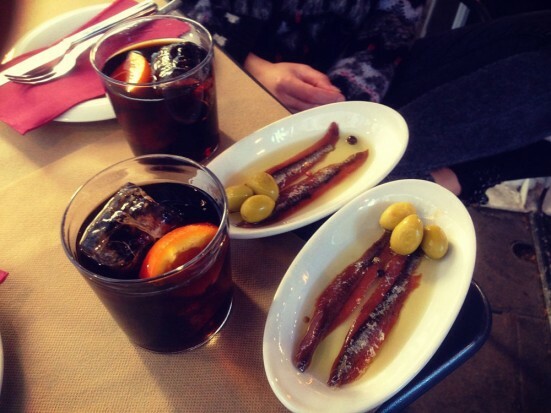 A good vermouth and my friends. When I am not socialising I enjoy the second-hand shops, whether I am looking for clothes or furniture. Revamping either are little projects that keep me amused. My favourite shops are Humana (they have shops all over Barcelona) and Mercantil. Whether you are training hard and need to offset your training routine with a Pilate’s class to keep those muscles healthy, looking to get into shape or recover from an injury or operation SimplyBePilates has Pilates classes for all goals. If you prefer you can WhatsApp us on +34 644 316 850 and ask for Devorah.